Are you looking for reliable South Africa Health Facts? Then you should check out our travel health info here. For specific information on health and medical care in Cape Town please go to the Cape Town health on ExpatCapeTown. Our South Africa Health Facts will provide some insights on how to protect your health when traveling to South Africa or living in Cape Town. In South Africa you should take special precautions regarding your health. HIV/Aids are widespread, the risk to contract Hepatitis or Tuberculosis when working in townships or rural areas is prevalent and rabies and typhoid are present in rural areas. But there are precautions to take, and for most of the more common diseases you can get vaccinations before your travels. So contact your health care provider or a travel health clinic before you move here or get help here at a local travel clinic. Check that your immunisation record is up to date or get refresher vaccinations. Check that your children's immunistaion programm (DTP, MMR) is also up to date. Seasonal Influenza is present during the winter months in South Africa as in many other places around the world. There is evidence that not only small children and older or frail people are more at risk, but also teenagers and pregnant women. So if you belong to a high-risk group you should consider the relevant vaccinations. Yellow Fever: The vaccination has to be taken 7-10 days before travels to an infected area. The vaccination certificate is valid for ten years. 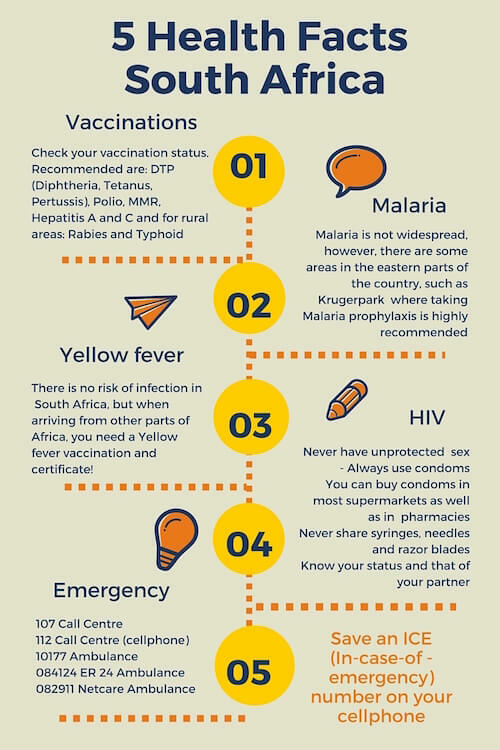 Malaria: tablets for protection you need to take a prophylaxis if you travel into certain regions in South Africa, not in the Western Cape or Cape Town. Prophylaxis usually needs to be taken before travel into the malaria regions in South Africa and at least one week after travels. To get your vaccination status updated, visit any travel health clinic or enquire with your general practitioner (GP) for advice. You will find more comprehensive immunisation information here. South African Department of Health provides insights into the state of the South African health system on their website. National Institute for communicable Diseases (NICD) provides more info and current statistics for South Africa. US Center for Communicable Diseases which also provides Country Information for South Africa. 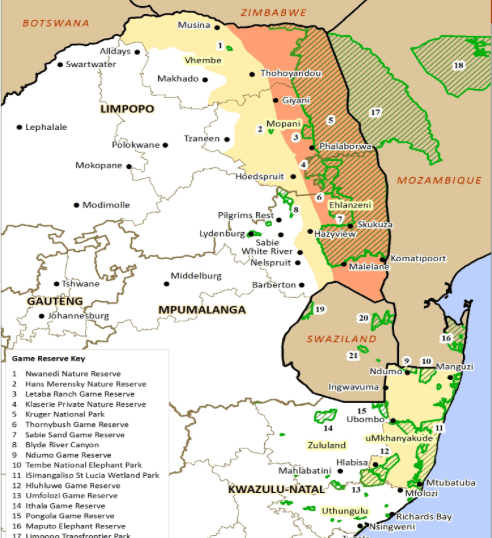 More Health Info for South Africa Travel by the CDC here. Be informed and check your South Africa Health Facts and Information thoroughly. Keep well!